Also available: First Communion instruction for all ages – Let Pastor Amy know of your interest, and we will schedule additional classes. 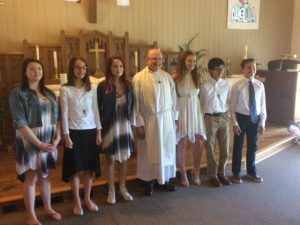 The Christ Lutheran community feels strongly about providing young people with an engaging, energetic and faith-awakening learning experiences for all ages and interests. Catechism/Confirmation: Young people and adults interested in learning more about their faith are encouraged to contact the church office (christlutheranvh@aol.com) or Pastor Amy Becker-Perez (pastor.amy.becker@gmail.com) to learn about Catechism Class. You will meet several times during the school year for informal, experiential learning and engaging discussion – including the opportunity to ask your hardest questions. Adults are encouraged to join in to enrich the discussion. First Communion: Children (and anyone) interested in learning more about the Sacrament of Holy Communion are encouraged to attend a one-day First Communion Class. The actual celebration of First Communion will be scheduled based on families’ schedules. See Pastor to get signed up. For information or conversation: If you or someone you know would like to participate in these programs, or if you have a suggestion for other options, please contact Pastor Amy (pastor.amy.becker@gmail.com). Thank you! We Lift Up Our 2017 Confirmands! We lift up the following people who made public affirmation of their faith on May 7, 2017 – Bobby Belzer, Emily Jo nes, Allie Menis, Tyllie Menis, Brooke Pieper and Jake Pieper. Best Wishes and God’s Blessings to you all!